Welcome back to the First Monday Library Chat! Today we travel to Germany with Elaine Leong and feature library of the oldest German university – The Heidelberg University Library. We’re delighted to be talking to Dr. Karin Zimmermann, Deputy Head of the Department of Manuscripts and Early Printed Books. Heidelberg University Library has large collection of printed and manuscript recipe books. Can you give us an overview of some of the rare and unique items in your collection? Heidelberg University Library (HUL) is the central library of Heidelberg University in the south-west of Germany. The University was founded in 1386 and is the oldest University in Germany. In the late 14th and early 15th centuries, three libraries were part of the university. They consisted of the book collections of the liberal arts faculty, of the higher faculties – with medicine – and of the collegiate church (Holy Ghost Church). The core of the collections in the faculty libraries consisted mostly of the books left to the university by professors. In this way by 1396 the university managed to build up a collection of over 600 books. In the 16th century Elector Otto-Henry combined this library with the Electors Palatine’s private book collections creating the ‘Bibliotheca Palatina’ – the Palatine library. In 1556, the library consisted of about 6,400 titles, including 4,800 printed books, 500 parchment manuscripts and 600 paper manuscripts. The sack of Heidelberg during the Thirty Years’ War, in 1622, brought a temporary end to what was at the time most renowned and important collection of books in Germany. At the beginning of the 19th century, the German manuscripts were returned to HUL. However, the Latin and Greek manuscripts and all printed volumes still remain in the Vatican Library. The main source of ‘old’ books, however, was the purchase of tens of thousands of volumes – about 450 manuscripts and thousands of printed books – from the library of the Cistercian Abbey Salem at the Lake Constance in 1826. Today HUL holds about 3.12 million books and periodicals, about 495,000 non-book-media and about 6,800 manuscripts. Nearly 980,000 of its volumes are printed before 1900. The library counts 42,200 active users and about 1.6 million loans per year. Most of the recipe books in the Heidelberg University Library are within the ‘Bibliotheca Palatina’ collection. There is a longstanding and fascinating research and digitisation project centred on this collection, could you share some details with our readers? In 1970, due to the outstanding importance of the Bibliotheca Palatina collection, the HUL began cataloguing the Latin manuscripts now in the Vatican Library in Rome. That project is financed by the DFG (Deutsche Forschungsgemeinschaft), the largest independent research funding organisation in Germany. From 1996 until 2014, the 848 German manuscripts in Heidelberg were catalogued. With the help of third-party funds, this part of the library was digitized in the Digitization Department of HUL by different projects and made available on open access. Additionally, from 2012 onwards, a team from Heidelberg has worked to digitize onsite also the circa 2,030 Latin manuscripts in Rome. Every week we digitize at least 10 additional manuscripts! Find out more here. Can you give us an idea of the scope of the recipe texts within the ‘Bibliotheca Palatina’ collection? How many are there? What kinds of knowledge are represented? 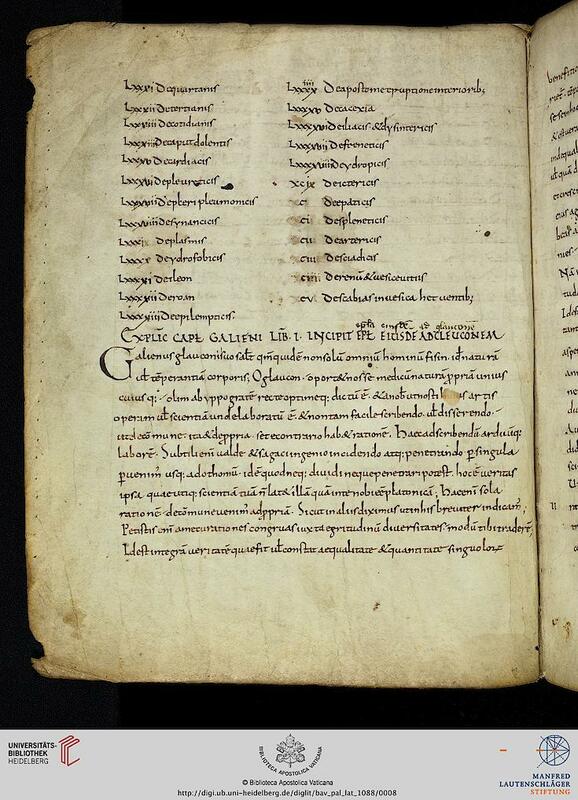 Let’s talk about the manuscripts, here we have to distinguish between Latin and German ones. Nearly all medical texts that had been used at the university to teach medicine were written in Latin. These 272 volumes transferred mostly ancient knowledge from authors like Hippocrates, Aristotle, Galenus, Avicenna or Averroes. The German manuscripts of the Bibliotheca Palatina, the Codices Palatini germanici, consist mostly of the vernacular part of the library at the castle, that belonged to the Electors Palatine and their families. The character of a court library can be seen in the topics covered by the books. 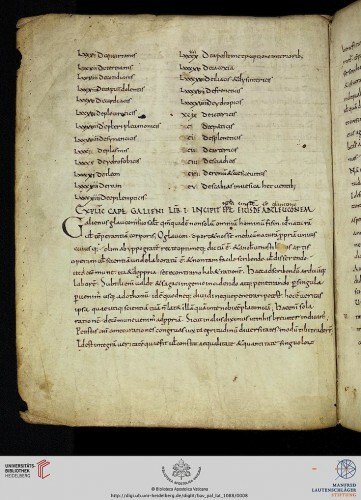 Most of the manuscripts, about one-third of the stock (ca 300), consist of medical and alchemical texts (http://archiv.ub.uni-heidelberg.de/volltextserver/portal/med-hs/), reflecting the interest of some of the Electors Palatine who were particularly fascinated by medical prescriptions. About 220 of these medical manuscripts date from the 16th century and nearly 75 originate before 1500. Approximately 50 of these manuscripts, written before 1500, transmit late medieval, to a small extent ancient Arabic medicine and tracts – that means ‘old’ texts. Another 20 of these older codices are alchemical texts. This kind of text usually consists of a plurality of recipes, practices or alternative instructions that are in a more or less fixed context of tradition, that is, they were to be preserved as a unit and therefore often passed on together (e.g. the ‘Arzneibuch’ [Book of Medicine] by Ortolf von Baierland). By far the most comprehensive group consists of about 220 handwritten collections of recipes with unknown authors. To give you an idea of the immense extent number of texts included in this group, I will give you some numbers. Extrapolated, there are approximately 193,000 recipes written down on about 40,000 sheets of parchment and paper. Finally, for those of us who living afar, could you tell us a little about we might be able to consult your rich holdings both via digitization schemes and via virtual exhibitions? 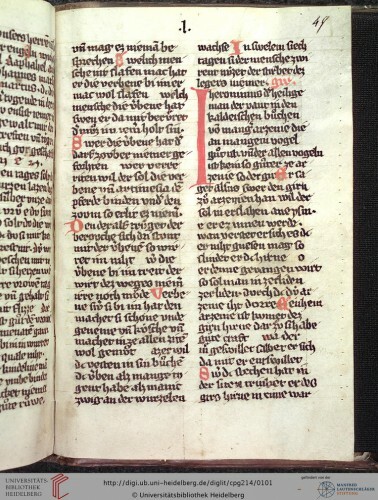 You can find all digitized manuscripts – German and Latin ones – on the constantly updated website of the project. To search inside of the manuscript descriptions you can use the database ‘PalatinaSEARCH’ (only in German). The virtual exhibitions can be found on a special website. The catalogue of the Latin medical manuscripts is digitized as well as the descriptions of the German ones. If you have any questions, feel free to contact Karin @ Zimmermann@ub.uni-heidelberg.de. Watch this space! In a later post, Karin will take a more detailed look at some highlights of the library and introduce to the fascinating group of collectors and compilers who created the recipe books within the Bibliotheca Palatina.